With more than 15 years of seal coating contractor experience and comparing more than 90 concrete sealers, I definitely have managed to select the 10 best concrete sealers. These have been discussed further as you will find out later in this concrete sealer review. Picking the best concrete sealer for your project can be a daunting task because there are so many options to choose from. You need to do your research well and totally understand your project needs before making the final decision. If you want a long lasting sealer, then you should consider buying these concrete sealers. Concrete is available in many different types and substrates that can be found both for the exterior and interior use. It can be a concrete driveway, brick paver patios, basement floors, kitchen floor, or vertical brick walls. Since concrete is extremely porous, it can be prone to degradation from the elements like UV radiation, water, oils, wear & tear, etc. Therefore, by sealing your concrete, you’ll be protecting and prolonging the life of your surface. If you are looking for more option then, look at this best driveway sealers list. Siloxane concrete sealer – this sealer is less volatile and provides water repellency at a very lower cost. It provides a nice natural finish, forms a sturdy barrier, and does not change the appearance of the concrete after application. 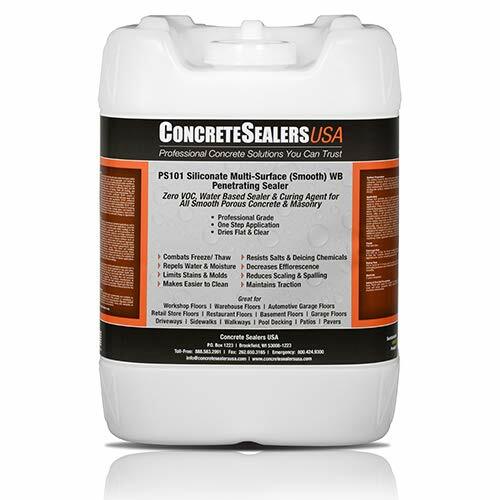 Penetrating sealer – it protects the concrete by sealing the pores below the surface. It is great at protecting the concrete from harsh weather conditions, freeze-thaw damage, slipping in cold or wet conditions, and against deicing stains and chemicals. Acrylic concrete sealer – it is great or both interior and exterior surfaces. Additionally, the Acrylic sealer keeps the overall cost down and it is simple to use. The sealer protects the concrete from UV-rays, water, chloride, and it enhances the color of decorative interior floors. Film-foaming sealers – this sealer works by forming a barrier on the surface. In short, it blocks penetration of water. Examples of this type of sealer are acrylic, epoxy, and polyurethane concrete sealers. It also enhances the color of the concrete surface and produces sheens of different intensities. 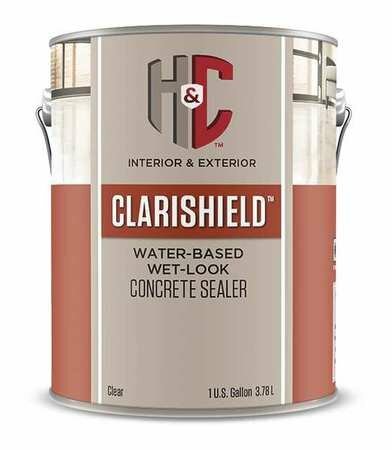 Clear concrete sealer – the sealer gives the concrete surface a polished look. It is also durable and easy to use. It brings out the color of the stained concrete and protects from penetration and staining. Moreover, it increases durability against foot traffic and normal wear and tear. Epoxy sealers – these sealers are very common for indoor use. It is usually applied in high traffic areas like the kitchen or bathroom and even on concrete countertops. It protects the surface from penetration, resists abrasion, and provides a durable, lasting finish. Stamped concrete sealer – this sealer needs water-based or solvent-based acrylic sealers. It is one of the cheapest and very easy to apply. The stamped concrete sealer is also breathable and will protect the surface from UV and other elements. Polyurethane concrete sealer – this sealer forms a protective film that offers resistance to chemicals and abrasion. It is also offered in both water-based and solvent-based options. It is also very durable and available in different sheens. We have selected all-time best selling concrete selaers here. 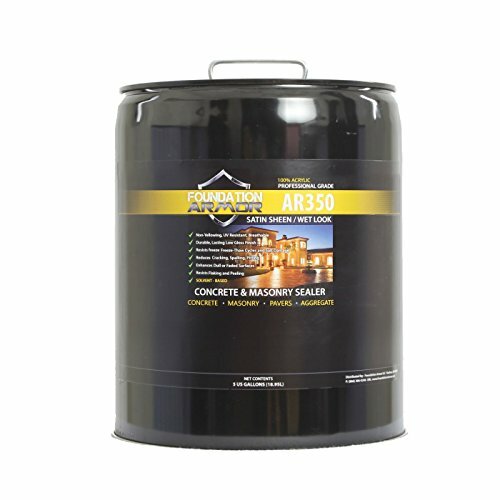 If you are looking for a perfect concrete driveway or basement floor sealer, the Foundation Armor sealer AR350 stands out from the rest. The solvent based sealer is non-yellowing and breathable. Being a penetrating sealer, the user will have an easy time applying it. After applying the sealer, it will leave your concrete with a satin sheen or wet look that most of the homeowners’ desire. In addition, it uplifts both dull and faded surfaces. Made up of acrylic, this sealer is very durable and it will defy abrasion, hot and cold temperatures, UV rays, hot tire pickup, peeling, and flaking. Furthermore, when properly applied, the acrylic sealer will last for 5 years before requiring another coat. It can be applied on different concrete surfaces such as stamped concrete, pavers, poured concrete, and integrally colored and acid stained concrete. The sealer will protect your concrete surface from the thaw, oil spills, and salt damage if properly used. Also, the 5 gallons can cover up to 500 sq. ft. in two coats. Are you looking for a 100% acrylic sealer? Look no further as the EnduraSeal acrylic sealer is made of 100% acrylic. Moreover, the sealer produces a semi-gloss finish that will leave your concrete with that amazing wet look. The non-yellowing formula that it contains means that you will not see any discoloration on your concrete anytime soon. Simply apply as recommended by sealing your concrete twice with a thin coat. Every single gallon of the 5 gallons will approximately cover between 150 and 300 sq. ft. depending on the porosity of the nature of the surface. In order to excellently apply this acrylic sealer, you need to apply the sealer using a roller or sprayer. Use it to seal your colored concrete, stained concrete, exposed aggregate concrete, or stamped concrete. Not only will this sealer beautify your concrete, but it will also protect it from salt, water, and oil spills. This best penetrating concrete sealer is suitable for curing new machine troweled concrete and for sealing existing concrete and masonry surfaces. The PS101 is breathable and forms a cross-linked insoluble methyl-silicone internal membrane that wears away only when the substrate itself wears away. These features make it be great for sealing both commercial and residential surfaces such as driveways, patios, pavers, garage floors, restaurant floors, basements, walkways, pool decks, etc. Apart from sealing concrete surfaces, it can be used to seal natural stone, mortar, brick, stucco, artificial stone, and block. If properly applied, the sealer inhibits the dangerous effects of salts, acid rain, chemicals, UV damage, corrosion of reinforcing steel, and alkali attack. Also, it restricts dirt buildup, mold and mildew growth, staining, and generally makes cleaning to be seamless. Unlike other sealers, PS101 will have no or little appearance after drying. This is because of its clear appearance. 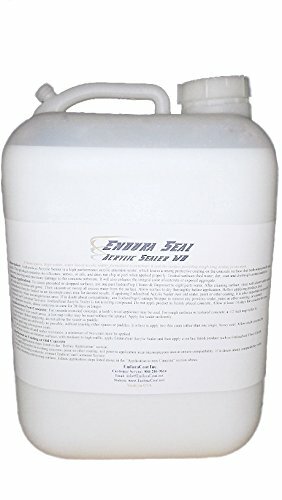 Looking for one of the best solvent based sealers on the market, the EnduraSeal acrylic semi-gloss sealer offers a great performance and it is made of 100% acrylic. The high solid, acrylic emulsion leaves a strong protective coating that doesn’t just seals but also waterproofs the surface. It is very easy to apply and one gallon of the 5-gallon sealer will cover approximately 200-400 square ft. depending on the nature of the surface and some other few factors. When applied properly, the acrylic sealer will limit oil, chemicals, grease, water, and other elements from damaging the surface. It is also non-yellowing, which implies that it will last for a very long period of time before applying another coat. The “wet look” finish enhances the look of the surface. Besides having these outstanding features, the sealer has a very low odor and it performs overwhelmingly. The Foundation Armor AG brown tinted concrete sealer is a professional grade sealer for curing and sealing concrete or masonry surfaces. It is a great option for those who want a long-lasting sealer that won’t fade, flake or yellow. Unlike most sealers, the Armor AG brown functions to enhance the appearance of the rock. It leaves behind an attractive, brown tinted semi-transparent high gloss finish. Additionally, it is very easy to apply by use of a sprayer or roller. The 5-gallon can cover up to 500 sq. ft. in just two coats. To fully benefit from this sealer, you need to properly apply it. After drying, Armor AG seal 25 will be able to provide improved resistance to different weather and temperatures. Also, it will resist UV, spills, spalling, stains. No mold or mildew will grow on the surface for a long time. Great for interior or exterior surfaces, the KILZ concrete sealer is an amazing low-gloss sealer that leaves a lasting impression concrete, brick or masonry surface. It is made up of a high-solid, non-yellowing acrylic-based formula that betters the look of tile, stucco, cement, and stone surfaces. Apply it inside or outside but prevent using it in high moisture places like pool decks. You don’t need any knowledge to use it as it is easy to apply with the help of sprayer, brush or roller. You can use the sealer one hour after applying it. Also, if you need to recoat it, you can do so after just 4 hours. The one-gallon sealer is able to cover around 250 to 400 sq. ft. depending on the nature of the surface and some few factors. When applied, it will protect and maintain the color and detail without fading. No water will penetrate through the surface and other elements will be kept at bay. The Non-toxic Bone Dry concrete sealer is a high-quality sealer that will prevent moisture and water vapor from penetrating into the concrete surface. Apart from that, it prevents dusting and resists damage from other elements. 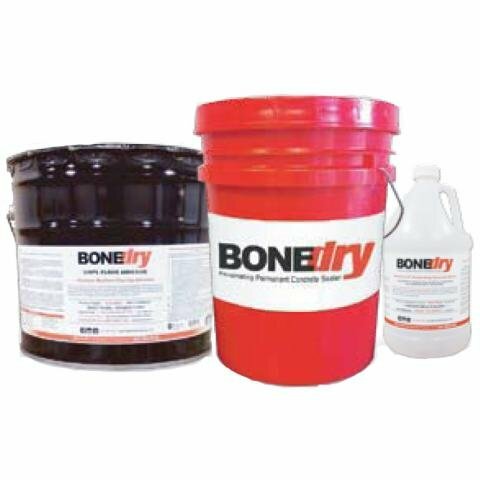 The bone dry sealer can be used to coat both new concrete slabs and existing concrete floor in your home. Applying it is not an issue and it dries quickly. One gallon of the sealer will cover at least 220 sq. ft. The users of this sealer have applauded it and highly recommend. Most of them say that it is great at inhibiting the buildup of mold, mildew, and it resists penetration of salts, oils, and alkalis. Being slightly corrosive, this sealer should be handled with great care and it should not be inhaled for long. Use with caution and it should not land on your skin. 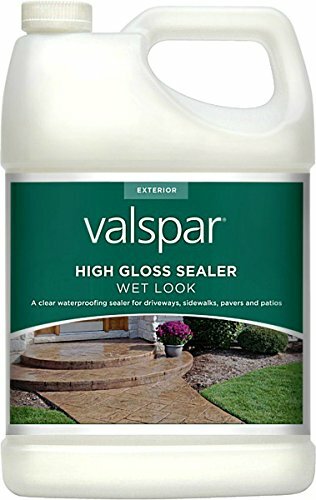 The Valspar concrete sealer works best if applied on pavers, concrete, FL, exterior aggregate, mortar, brick, and masonry. If you intend to use it on a garage floor, look elsewhere. The water-based sealer with acrylic barrier formula offers unparalleled protection to your surface. It will protect the surface from salt, stains, water, and UV rays. In addition, applying the high gloss concrete sealer is not a problem at all. Just use a roller or a sprayer and it will leave a nice high-gloss finish that will last for many years. This one-gallon container will approximately cover 200 to 400 sq. ft. depending on the type of the surface being applied on and some other factors. Only apply it outside and not inside to achieve a waterproof and enhanced concrete surface. It is also important to note that various users have complained about it not being very effective and the wet glossy surface turning to white. Tired of waiting for several days before the sealer dries and the driveway is ready for use? 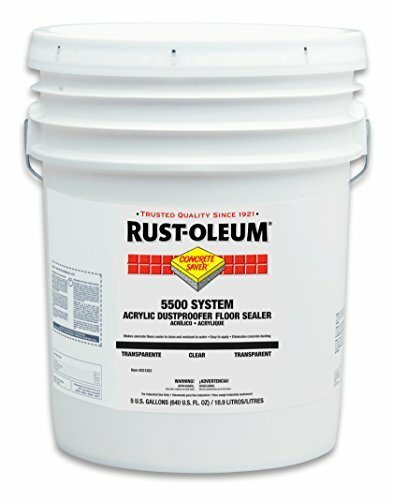 Get the Rust-Oleum concrete sealer. Comprising of acrylic, the Rust-Oleum sealer is wonderful at protecting top coat and sealing uncoated concrete. A driveway cured and sealed with Rust-oleum is very easy to maintain and leaves behind a low-gloss finish. It can also be used inside or outside. The sealer dries very fast as it only takes 12 hours. Furthermore, Rust-oleum acrylic sealer has a low odor and cleaning isn’t a problem. It is also eco-friendly as it is VOC compliant. You can use it on residential or even commercial surfaces. The dust proofer functions best when the temperature is between 50 degrees F and 100 degrees F. With this sealer, no water, oil or dust will damage your concrete surface, be it a pavement, driveway, or walkway. If your intention is to protect your concrete driveway, patio, paver, or walkway from mold & mildew growth, oil spills, UV rays, or water penetration, then try out the H&C concrete sealer. This water-based and acrylic resin sealer functions well indoors and outdoors. All you need is to properly seal your surface and you will greatly benefit from it. Apply it on a concrete, stucco, or brick surface. 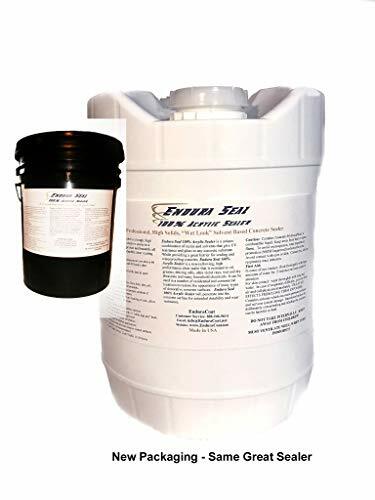 One-gallon of the 5 gallon can is able to cover around 200 to 300 square feet depending on the porosity of the surface and some other factors. Apply the concrete dustproof floor sealer when the temperature is between 50 and 95 degrees F. Utilize a brush, sprayer, or a roller to properly apply the coat. It will take around one hour to dry for foot use and 24 hours for a car. If you have to do a recoat, wait for 2 hours after the first coat has dried. This sealer will not change the look of your concrete driveway or walkway after sealing it as it is clear. This means it will still maintain its natural look but still be protected from dangerous elements. Tuff duck is an excellent countertop and sink sealer. It is non-toxic and contains a water-based formula that is also food safe. Applying it is very easy due to its formula. The satin finish leaves a shiny surface that is good to look at. But at the same time, you will be able to protect the countertop or sink from stains, oils, and water penetration. To ensure that the sealer is properly utilized, follow the detailed instructions of the manufacturer (supplied with purchase). 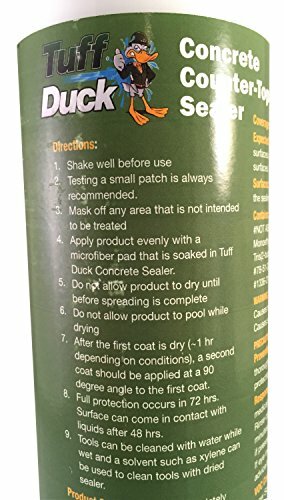 The 750ml bottle of Tuff Duck concrete sealer can cover around 45 to 60 square feet depending on the porosity of the surface and some other factors. The sealer works by penetrating deep into the concrete while leaving a long-lasting shell on the surface. Apart from the amazing features that this countertop sealer offers, it also comes with a 10-year warranty. So, you can be guaranteed that you will not coat your concrete sink or concrete countertop any time soon. 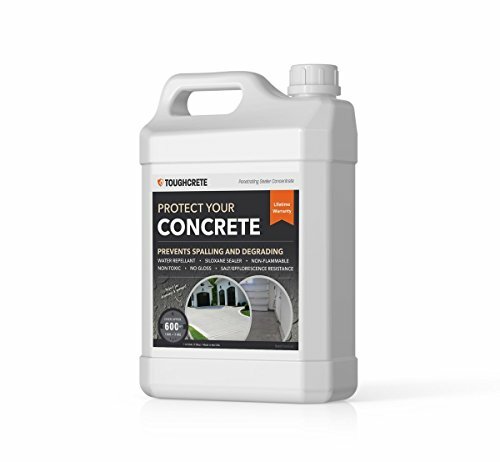 ToughCrete concrete sealer is one of the best performing concrete sealers on the market. The siloxane concrete sealer is the best option for curing and sealing your garage floor, driveway, patio, walkway, pool deck, or any other concrete surface. It contains acrylic that penetrates deep into the surface providing 10 years plus protection from elements like water, oil, salt, grease, and UV rays. In addition, it is safe and eco-friendly so that your health won’t be at risk. Created with the highest quality formula for total protection, this sealer is very easy to apply and dries quickly. The one-gallon bottle can cover up to 600 square feet with a clear finish. The clear finish is a result of its no gloss formula. So, the concrete surface will remain natural or as it were before. With a 10-year warranty, you can be sure that this sealer will function perfectly on all your concrete surfaces. Kilz is a good low-gloss masonry sealer that can be applied on both interior and exterior surfaces. The sealer is made of a high-solid, non-yellowing acrylic-based formula that improves the surface where it is applied on. It can be stucco, aggregate, natural stone, brick, masonry, concrete, or an artificial stone surface. Despite being applicable on a wide range of surfaces, it should not be used in high moisture areas such as pool decks. 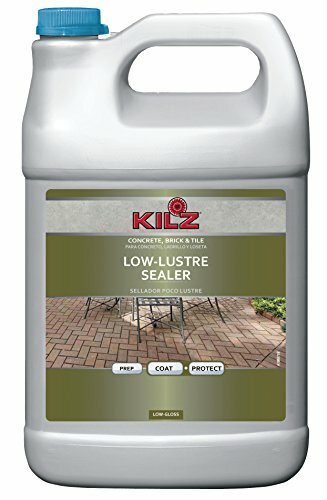 One gallon of the KILZ low luster sealer is enough to cover around 250 to 400 sq ft depending on the nature of the surface. It is also easy to apply by use of a brush, roller, or sprayer. Moreover, the sealer dries within an hour and can be recoated in just 4 hours. If properly applied, it will prevent oil, dust, grease, rust, wax, stains, mold, mildew, and any other substances from damaging your surface. This penetrating concrete sealer from Black diamond coatings inc. is suitable for sealing your driveway, patio, sidewalk, and pavers. 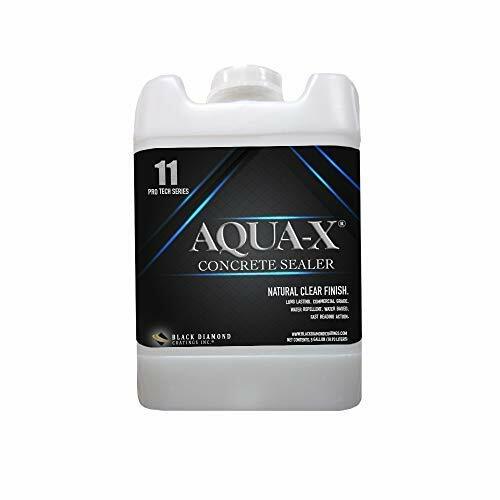 It is a water-based penetrating silicone sealer that repels water and forms a moisture barrier in order to prolong the life of the paver, block, natural stone, grout, or masonry surface. Apart from that, it prevents the concrete from spalling, resists UV rays, and inhibits the growth of mold and mildew. This, in turn, makes cleaning and maintaining the surface to be easy. One-gallon of the 5-gallon can is capable of covering up to 600 square feet depending on the nature of the surface. In addition, it doesn’t change the appearance of the surface like other sealers. But the good thing is that it is low in VOC and can be applied on both interior and exterior surfaces. Repairing or maintaining your concrete surface by sealing the cracks or fillers is a simple process. But you need to follow the right steps so that you do a great job and prevent further damage. Also, check the instructions provided by the sealer to ensure a long-lasting impression. There are two ways of sealing the concrete. You can either use a sprayer or a roller. The choice is yours. Other items that you will need include a degreaser, scrub brush, putty knife, mop, concrete filler (if required), and a sealer. Begin by removing everything from the surface. Note that, the sealer only functions if it is applied on the whole surface. If there is anything along the edges, it should as well be removed. This includes grass or baseboards. If you are sealing indoors, the windows should be opened. Rigorously sweep the concrete surface in order to get rid of all dust and other particles on the surface. Utilize a degreaser to remove any traces of oil or grease on the driveway or garage floor. Try as much as possible to scrub all the stains off. Finish the cleaning process by mopping the floor and getting rid of any remaining traces of chemicals or dust. Then, allow the concrete surface to dry. If you have large cracks, apply concrete filler or any other damage as recommended on the product. Then, smooth it over using a putty knife and allow it to cure for some few hours. Pour a small amount of the sealer into a sprayer or paint tray. Apply the sealer in a thin, even coat on the whole concrete surface. A brush should help you to properly apply the sealer along the edges before moving on to the middle of the surface. After applying, give the surface time to dry. It is recommended that you leave it for 24 hours or you can use a fan to speed up the drying process. You can add an extra coat if your sealer says so. With so many concrete sealer types and brands to choose from, it is better you carry out a thorough research and acquire a quality concrete sealer that meets the needs of your surface. The best concrete sealer will help to cure and seal your concrete, thus strengthening, protecting, and improving its appearance for many years to come. Also, follow the proper procedure for sealing your concrete to get the best results. So, make a wise choice and you will be happy with your investment! Q. How long does a quality driveway sealer last? Ans. Depending on the quality of the driveway sealer and how it is applied, it can last for at least 10 years. But you will need to properly maintain your driveway or else it will not last that for a long time. A good number of concrete sealers last for at least 8 years and if it’s a film-forming sealer, you should apply it within 3 years. Q. Which is the best concrete sealer to use; acrylic or epoxy? Ans. Both of these sealers are amazing in performance but have some slight variations. For instance, Acrylic sealers are suitable for both indoors and outdoors, while Epoxy sealers are only ideal for indoors. However, Epoxy sealers are more durable than acrylic sealers. Another difference is that acrylic sealers cure and dry faster than Epoxy sealers. They usually take only 24 hours to dry while the later takes more time than that. Q. What is the best concrete sealer? Ans. The best concrete sealer varies depending on the needs of different surfaces. A sealer that is good for your exterior concrete surface may not be ideal for your interior concrete surface. Also, some people may prefer a sealer with a natural finish, while others prefer one with a gloss or enhanced finish. Q. Which sealer should I use in a cold or warm climate? Ans. Before you choose a sealer, you should be certain that it will work in your area. A sealer that works best in a cold environment may not replicate its performance in a warm climate. So, the best sealer for a cold surrounding is siloxane or silane blend. For the warmer climate, you can either choose acrylic-based sealers or silane/siloxane sealers. Q. What will happen when I seal the concrete when the temperatures are too hot or too cold? Ans. Extreme temperatures can make the sealer to dry very fast or very slow. It is recommended to seal concrete when the temperature is between 50 degrees F and 80 degrees F. Different sealers have their own minimum and maximum temperatures required for them to dry. In most case, the minimum is around 40 degrees and the maximum 95 degrees. A lower temperature causes the sealer not to dry and it won’t last long, while a higher temperature will make the sealer to dry unevenly. Still, have a question after reading this best concrete sealer review? Comment below.